Emollients are cosmetic preparations used for protecting, moisturizing, and lubricating the skin. These functions are normally performed by sebum produced by healthy skin. 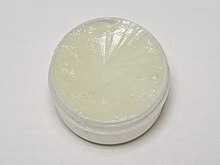 The word "emollient" is derived from the Latin verb mollire, to soften. Water constantly evaporates from the deeper layers of the skin, an effect known as transepidermal water loss (TEWL). By regulating its water content, skin maintains a dry, easily shed surface as a barrier against pathogens, dirt, or damage, while protecting itself from drying out and becoming brittle and rigid. The ability to retain moisture depends on the lipid bilayer between the corneocytes. Emollients prevent evaporation of water from the skin by forming an occlusive coating on the surface of the stratum corneum. TEWL is normally about 4–8 g/(m²⋅h). A layer of petrolatum applied to normal skin can reduce the TEWL by 50–75% for several hours. Humectants also have an emollient effect, but they act differently, by drawing water into the stratum corneum. The more lipid in the formulation, the greater the emollient effect. Ointments are more emollient than oily creams which are more so than aqueous creams, while most lotions have no emollient effect. Emollients are available as lotions, creams, ointments, bath oils, or soap substitutes. Petrolatum (White Soft Paraffin) is probably the most effective emollient. Other popular emollients are castor oil, cetyl alcohol, cetearyl alcohol, cocoa butter, isopropyl myristate, isopropyl palmitate, lanolin, liquid paraffin, polyethylene glycols, shea butter, silicone oils, stearic acid, and stearyl alcohol. Mineral oils and waxes are insensitive to oxidation or rancidity. For this reason, they have essentially replaced vegetable oils in emollients and topical medication. Emollient cosmetics may additionally contain antioxidants, ceramides, emulsifiers, fragrances, humectants, penetration enhancers, preservatives, and solvents. Some products are marketed as having anti-wrinkle and skin enhancement effects. Many plant and animal extracts have been claimed to impart skin benefits, with little scientific evidence. Although various lipids or emollients have been used for anointing throughout history, this use hardly counts as cosmetical in today's sense. Scientific cosmetic chemistry exists only since 1920. Emollients are used for the treatment of certain skin ailments, such as psoriasis, ichthyosis vulgaris, xerosis, and pruritus in atopic dermatitis. More often, they are bases or vehicles for topical medication, such as in Whitfield's ointment. They are often combined with keratolytic agents, such as salicylic acid and urea. Emollients are also widely used in sunscreens, antiperspirants, skin cleansers, shaving creams, aftershaves, and hair tonics. Emollients are used in disposable napkins to prevent dry skin and napkin dermatitis. A Cochrane review noted that moisturizers show some beneficial effects in eczema. The same review did not find evidence that one moisturizer is better than another. Moisturizing lotions are mainly intended to improve the skin, but can also harm it. Moisturizers contain ingredients that are either occlusive (blocking) or humectant. Occlusive agents are used to help block the loss of water from the skin. Humectant agents are used to attract water to the skin. Significant water exposure to the skin can cause the loss of soluble natural factors. Persistent moisturization to the skin from exposure to water may contribute to an allergic reaction or irritant contact dermatitis, and can result in penetration of foreign objects. Changes in the skin's normal ecological environment, in or on the skin, can support the overgrowth of pathological organisms. Lotions contain 65-85% of water. Water acts as an agent to disperse the active and inactive ingredients in the lotion. A high water content also serves as a way for the absorption of some components and evaporation of the moisturizer. Water acts as a temporary hydration agent. ^ a b van Zuuren, Esther J; Fedorowicz, Zbys; Christensen, Robin; Lavrijsen, Adriana PM; Arents, Bernd WM (2017-02-06). "Emollients and moisturisers for eczema". Cochrane Database of Systematic Reviews (Review). 2: CD012119. doi:10.1002/14651858.cd012119.pub2. ISSN 1465-1858. PMID 28166390. ^ Marino, Christina (2006). "Skin Physiology, Irritants, Dry Skin and Moisturizers" (PDF). Skin Physiology, Irritants, Dry Skin and Moisturizers.